If you’ve ever watched dust-motes dancing in a sunbeam then you’ve observed Brownian motion. It is the jerky, fluttering motion of particles in fluids such as air or water. The botanist Robert Brown first described the motion in detail. He demonstrated that it was not caused by some living organism, but was never able to determine its cause. That answer came from Albert Einstein, who proved that Brownian motion was due to molecules of the fluid colliding with the Brownian particle. Brownian motion was definitive proof of the atomic theory of matter. Even though we couldn’t (at that time) see the atoms which make up matter, we could see the effect of their existence. 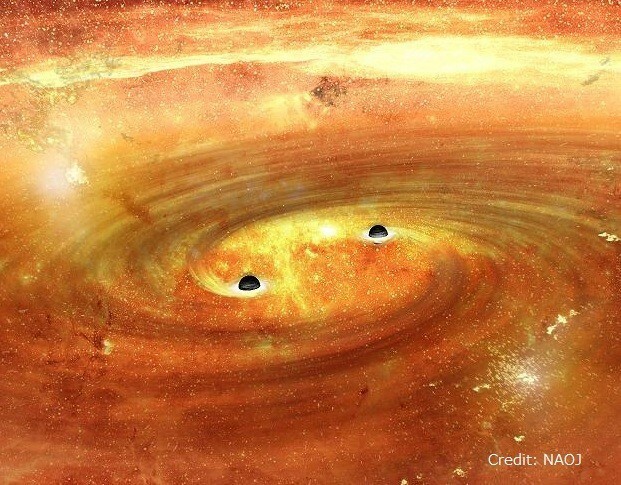 What does all this have to do with black holes? Well it turns out black holes also undergo Brownian motion, and astronomers can use that fact to their advantage. Within most galaxies is a supermassive black hole. These typically have a mass a hundred thousand to a billion times larger than our sun. They reside in the center of the galaxy, surrounded by a dense cluster of stars. Just as a dust-mote is knocked about by the tiny atoms surrounding it, the black hole is knocked about by the (relatively) tiny stars surrounding it. Obviously we can’t observe this motion in real time, but its effect is clearly measurable. There is an important difference between dust-motes and black holes. For traditional Brownian motion, the atoms move very much like billiard balls. An atom moves freely through space until it collides with the dust-mote, the collision happens very quickly, and then the atom moves freely again. But stars surrounding a black hole do not interact like billiard balls. For stars and black holes, the interaction varies depending on how close a star is to the black hole. This means that while the billiard-ball type model for Brownian motion can’t be used to model stars and black holes, you also have to take into account how the black hole’s gravity affects the distribution of stars in the first place. Typically, the Brownian motion of a black hole has been modeled by starting with a galaxy of stars in an equilibrium state, then adding the black hole to the model to see what happens. But fellow RIT faculty David Merritt and his team modeled a galaxy of stars in equilibrium with the central black hole from the beginning. What they were able to show was that this new approach makes a significant difference in your predicted outcomes. Essentially, the presence of the black hole means that closer stars have more kinetic energy on average than more distant stars, and these closer stars in turn create most of the Brownian motion of the black hole. The reason this matters is that Brownian motion can be used to determine the mass of the black hole in the center of our Milky Way galaxy. Measure the distribution of stellar speeds near the center of our galaxy and you can determine the mass of the central black hole. Merritt and co. determined the mass of our galactic black hole to be about 1.2 million solar masses. Pretty big, but smaller than older measurements which gave a value of about 3 million solar masses. All this from treating a huge black hole as a cosmic speck of dust. As of 2016, I keep reading that the black hole at the center of our galaxy is about 4 million solar masses. However, this article states that, because of Brownian motion studies, the mass is actually about 1.2 solar masses. I can understand the discrepancy, but do not understand why the currently stated value remains at 4 million solar masses. So, which is correct? It’s around 4 million solar masses. 4.1 million if memory serves. Brownian motion is defined as random motion. Our galaxy with it’s black hole center is clearly not moving in a random motion, you can see the circular motion, caused by the gravitational effect of the black hole. If our galaxy were controlled by random motion there would be no observable circular rotation towards the center black hole?